Home > Catch of the Day: H & H Fresh Fish Co.
Years as fisherman and fishmonger have helped Hans wade through seas of information and misinformation. 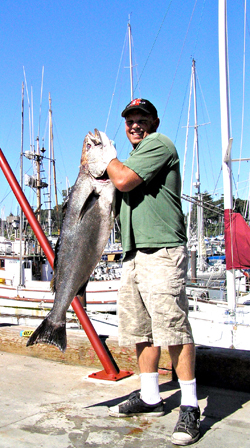 He grew up with a love of diving, surfing, and sport fishing, and by age 12, he was taking people out on boats to fish for salmon and rockfish in the Monterey Bay. During summers in high school, he worked on commercial fishing boats, where he gained a broad view of the commercial fishing industry through crabbing, trawling, trolling, gillnetting, bob-and-reel, and hook-and-line operations. He also spent some time working in kitchens, including a stretch with Wolfgang Puck in Los Angeles. 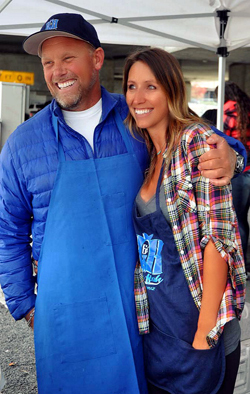 Besides the CSS program and a bit of wholesale marketing to restaurants, Hans and Heidi still sell most of their seafood at farmers markets (they currently have a presence at 17). They like direct marketing because it allows them to talk to consumers about the intricacies of sustainable seafood shopping. There are a number of programs to help seafood lovers navigate these murky waters, such as the Marine Stewardship Council, which sets international standards for sustainable fisheries and seafood traceability through its certification and ecolabeling. The Monterey Bay Aquarium’s Seafood Watch program’s popular pocket guides rank seafood by best choices (those that are sustainably harvested or farmed), good alternatives, and species to avoid (those that are depleted or caught in ways that ecologically harmful). 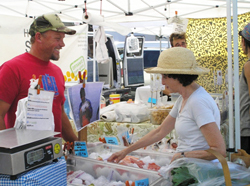 Hans considers the education that he does at farmers markets to be a complement to guides like Seafood Watch, which don’t always reflect what’s seasonal and sustainable at a given moment. “I like to be a helping hand to the guides that are out there,” he explains. All of H & H’s market employees (some fishermen themselves) help with processing and packaging, so they are able to share first-hand knowledge as well. Hans stresses that determining what’s sustainable requires asking questions of your fishmonger, such as when and where the fish was caught, who the fisherman was, and what catch method was used. He tries to meet customers where they’re at, share what he knows, and let them decide for themselves. “People have different ideas of sustainability or how sustainable they want to be. I’ll be honest with them, and then they can make their own choices,” he says. While much of H & H’s seafood is caught within 50 miles of Santa Cruz, they also offer high-demand exotics like ahi and ono, which they source from hook-and-line fisheries in Hawaii. In the winter, they bring in wild salmon from Alaska. “Even though importing has a bigger carbon footprint, Alaska is still relatively close and is extremely well-managed,” explains Hans. He also sources some fish through aquaculture operations that he considers to be sustainable, such as sturgeon from an antibiotic- and hormone-free caviar producer in Sacramento. What fish is he most looking forward to this spring? Salmon, of course. After a recent fishing ban due to depleted stocks, Pacific salmon is on the rebound, which means boats will be out in full force when the season opens on April 7. “It’s one of our biggest Northern California fish that we all love, and it’s gone from being a scary thing to coming back pretty strong,” he says. H & H Fresh Fish starts tomorrow at the Ferry Plaza Farmers Market. You can find them in the back plaza every Saturday from 8 am to 2 pm.